Enjoy sweeping Lake Superior views from your private decks. Aspenwood 6526 is a 3 bedroom, 4 bathroom townhome in Tofte, MN. Enough seating for everyone to share their days events in Lutsen. Living and dining area are open to the kitchen. Plenty of room in the open living room area for dining and relaxing. Living room also features a gas fireplace, good for those cold winter days. Enjoy your meals with plenty of room for all at the dining room table. Prepare your favorites in this well-equipped kitchen. Kitchen full of all the amenities you need to feed everyone. The lower level has a nice entertainment area Enjoy your favorite football game or sports events in the lower-level living area. The third sleeping area is located in the lower level. It features a sleeping sofa and a twin trundle bed. Lower level has a Shower/Tub combo. Step outside and enjoy the view of Lake Superior from the patio. Relax in this king size bed in the master bedroom, complete with a Lake Superior view. Master bedroom with kingsize bed and private bathroom. Master bedroom has access to a small balcony. Master bedroom has its own bathroom. Bathroom features a nice jetted tub and shower. The guest bedroom features a queen bed and has its own bathroom. Tub and shower combo attached to the guest bedroom on the upper level.. Cozy den is located in the main level and features a full bed. Enjoy this section of cobblestone beach. Begin your day watching the sunrise, you can also catch the sunset most of the year. Listen to the waves crash against the shore. Convenient, end unit location. This lovely Tofte vacation townhome rental along the North Shore of Lake Superior is filled with comfortable, country charm. Perched on a cliff overlooking Lake Superior, this three level vacation rental is an end unit filled with light and views of the big lake. The main floor and second floor have private decks for enjoying the sun. An open floor plan includes large kitchen, living room with gas fireplace and picture windows facing the lake. Downstairs offers a separate, relaxed sitting area. Master bedroom has a jacuzzi-style tub. Three bedrooms, four bathrooms, and room to comfortably sleep up to 8 guests. Skiers and snowmobilers are welcomed. This rental has in-floor heat on each level, creating a warm and cozy setting with the ability to adjust based on each person's needs. The 1 car garage is available to store your winter gear. Take advantage of everything the area has to offer or stay in and do nothing at all. Either way, Aspenwood has what you are looking for. Aspenwood is centrally located, close to many North Shore attractions. Here you are just a short 8-mile drive from Lutsen Mountains, a premier winter ski resort and summer recreation destination. You are also just a short drive from hiking, golfing, biking, skiing and more. Superior National State Park hiking trails, Oberg Mountain, Sawbill Trail, Gitchi-Gami bike trail, Tofte Park (with Lake Superior boat launch), and Temperance River are just a few of the attractions just minutes away. Need more space? Check out all of our Aspenwood Townhome options! We have 1-, 2-, 3-, and 4-bedroom options available. Rent multiple units for larger parties. Overall, the property was excellent and a great location for us near Lutsen. The internet was excellent and we loved the views of Lake Superior. This is our fourth year staying at Aspenwood Townhomes! Our two families come up to ski. We fit very well in the rental and enjoy being able to cook and relax together in one space. The three levels provide extra quietness at night. The washer/dryer are a bonus. The lake view is lovely. 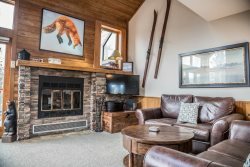 The location is convenient to ski hill and other local amenities.